Perhaps Xiao Yu’s taunting face was too obvious, which made Yan Jin reach out to flick the hamster’s little forehead. “Squeak!” Xiao Yu complained as he hugged his head. Xiao Yu stuck his tongue out. The hamster had pulled off the golden walnut that Yan Jin had given him a month ago within a few days, leaving it to collect dust inside the cage. The golden melon seed that was given to him this morning before Yan Jin headed out was also angrily thrown beside the golden walnut as partners. It went without saying that it was an unwise decision to let a hamster hang any item on its body – even if that that item was meant to locate its position. Plus, Xiao Yu’s activity range was limited within Yan Jin’s bedroom. He felt that Yan Jin absolutely did not need to worry about whether he would go missing. He was long past the rebellious age after all. What Xiao Yu did not realize was that Yan Jin had, in fact, thought that Xiao Yu would get bored when the chairman was at work. Hence, the idea of bringing the hamster to his company was formed. However, Yan Jin was worried that Xiao Yu would lose his way, so he proceeded to make a tracking device in the form of a little golden walnut accessory. Too bad the hamster never cooperated, so the chairman had given up on the idea. If Xiao Yu knew that Yan Jin had plans to bring him out, the hamster would probably be wild with joy and agree to any conditions that came with it. What? Put on a walnut and I get to go out? What a bargain! Not just one, I would even put on a hundred of them! However, the hamster did not know that he had missed that opportunity forever. Xiao Yu was actually feeling tired, so he quickly agreed. But before the hamster returned to his cage, he used his little paw to pat the cufflinks that Yan Jin had left on the table, using his little eyes to hint at Yan Jin to keep them safe. Yan Jin smiled softly as he pulled the drawer open, took out a small box from inside, and stored the cufflinks in place. As Yan Jin watched the pair of silver cufflinks being tucked away quietly on the satin surface, the chairman looked as if he had sunk into his own private dimension. His gaze was as gentle as the moonlight that shone down on the horizon. He brushed against the velvet box as if he was caressing a lover’s face. Xiao Yu had seen that gaze before. He knew that it was a kind of hope. Yan Jin must have placed some sort of emotion onto those cufflinks. It was a pity that those feelings may never be understood, even by the cufflinks’ creator. However, no matter who they were, any designer would feel proud if they knew that their own creation was able to become someone’s cherished memory. Xiao Yu was very pleased that these cufflinks were able to find an owner who deserved them. Xiao Yu, who had already returned to his cage, heard that in a daze. Although it was a soft mumble, it sounded like a sudden clap of thunder, exploding in his ears as the hamster jumped in shock. Wait, what did Yan Jin just say? Xiao Yu still remembered when he watched the live broadcast recently. The title for the mystery designer, Mr. Mystery, was indeed coined by Yan Jin at the last moment. At least, Xiao Yu had always assumed that he was named at the last moment. Which was to say, Mr. Mystery – this name was how Yan Jin referred to him all along? The Xiao Yu from the previous life, FISH, was the real owner of that name. However, he never received the name that Yan Jin had given him. This time, Xiao Yu became the mystery designer, yet he received this name that belonged to FISH by accident. Xiao Yu was caught up in a bewildering situation. He felt like all this was just a dream where memories overlapped repeatedly like an endless loop. It could not be interrupted, and it got even messier if you interfered. Maybe when Xiao Yu woke up, he would realize that becoming a hamster that Yan Jin had kept was just a nightmare. Perhaps he would still be SI’s chief designer, Yan Jin would still be the person he hated the most, and YL would still be his arch-enemy? This night was destined to be a sleepless night. When daybreak rose from the horizon, Yan Jin and Xiao Yu finally fell asleep. The next day was a Monday, the first day of the work week, but Yan Jin wasn’t worried as he had already taken leave from work. As for Xiao Yu, needless to say, he had nothing to worry about. Whatever time he slept or woke up at made no difference to him. He had completely integrated himself into a highly-dependent creature, living his life in the moment as a freeloading hamster. If it wasn’t for Yan Jin’s strict supervision, maybe Xiao Yu would have messed up his biological clock long ago. The next day, Xiao Yu was woken up by the sound of knocking. Xiao Yu came out from his little house as he yawned. Then, he realized that his cage was placed in the living room as Yan Jin carried it out of his bedroom. Xiao Yu lowered his head and read the time from Chu Ge’s phone – 11:25 am – What kind of morning was that? It was almost noon. Xiao Yu glared at Chu Ge icily. In any case, today was a Monday. Didn’t he need to go to work? Date? What kind of joke was that? Plus, didn’t Chu Ge break up not long ago? And he got a new date so quickly? And what’s with ‘dad’? No way he wanted Yan Jin as his dad. That guy was his owner at best. Then again, none of these were the main focus – Birthday? What birthday? Whose birthday? Xiao Yu glanced at the date – It was the fifteenth. Those somewhat familiar digits stimulated Xiao Yu’s memories. He remembered the golden walnut, the rows of empty rooms along the second story, and that dream-like hamster town. Right, Yan Jin had said before that he would celebrate his birthday every month. So the time had arrived again? Xiao Yu ran back into his cage, fumbled around and successfully found the golden melon seed that Yan Jin had given him yesterday in the nooks and crannies of his cage. With Yan Jin’s assistance, Xiao Yu put out the two slim candles. He also conveniently made an almost impossible wish that his snacks would double in quantity overnight. Previously, after they had that incident, Yan Jin rarely gave human food to Xiao Yu. That was why while the two people were eating heartily, Xiao Yu could only bitterly munch on his hamster food. That super extravagant butter cake on the table was only there to admire but not to taste. “I’ve given you the present beforehand. Do you like it?” Yan Jin asked as he scratched Xiao Yu’s little stomach. 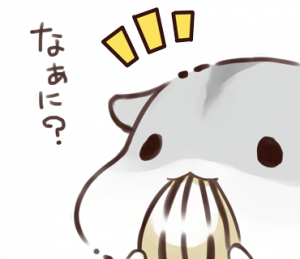 Xiao Yu looked in disgust at the golden melon seed with carvings on its surface, and nodded his head reluctantly. As a (former) top-class designer, Xiao Yu could only feel his eyes sting when he saw such an unrealistic and unpleasant melon seed that god knows what kind of designer drew. That feeling was similar to a graduating high-school student receiving a set of five-year series exam strategy books. However, at this moment, such thoughts would have spoiled the mood. Even a graduating high school student would consider someone that remembered their birthday as a kind of a blessing, whether or not there were presents. Moreover, he was a hamster that wasn’t even considered a person. What did he do to deserve such high preferential treatment? The hamster arrogantly decided – Okay then, seeing how sincere you are, I shall reluctantly accept such an ugly present. Chu Ge had something to attend to in the afternoon. He left in a rush after he had lunch. However, before the doctor went off, he deduced what had happened last night based on the wound on Yan Jin’s face. He instructed about a hundred times, “You must call me up if such things happen again”, before leaving satisfied. Yan Jin admitted that he was in the wrong, hence he did not argue much on this matter and absent-mindedly agreed to Chu Ge’s words. After Chu Ge left, Yan Jin tidied the living room a bit before he took Xiao Yu to the second level. While they were still climbing the stairs, Xiao Yu was already excited. Previously, he had no idea what the second level held, but now, he had a very clear idea. The second level was his favorite playground, it was his mini hamster town! Counting the times since he first went, Xiao Yu had already been there seven or eight times, but that was not enough times to feast his eyes on the entire mini town. However, Yan Jin would only bring him up there to play at most once a week, and it would mostly be on the weekends. He rarely went up there. Was this an additional reward because it was his birthday? As they reached the second level, Xiao Yu’s eyes sparkled brightly as he stared intently at the door on the left. Behind that ordinary looking door, there was a fantasy town made from the work of the Gods. Yan Jin took a right turn. Xiao Yu looked on helplessly as his mini hamster town got further and further away. Yan Jin pulled the door open and his footsteps stopped. His attention was instantly attracted. Without the lights on, Xiao Yu could clearly see a building; an interesting and appealing old manor, standing amidst the maple forest, blending seamlessly together. Under the night sky, the specks of light illuminated that tranquil building as if it was a masked beauty – unclear yet enchanting. It was more beautiful than any vast sky full of stars. It was more fascinating than any dark night. The fallen snow covered the tree barks and evenly spread out onto the rooftops of every household. The warm orange light contrasted with the frosty red maple leaves. Gentle swaying lanterns hung high above ground, and the rhyming couplet that was pasted on the doors signified the celebration of the new year. It was like those old manors that belonged to the wealthy families which only existed in the historical era. It was simply so beautiful that Xiao Yu felt that inside the manor, there lived a magistrate who was conferred a piece of land, or maybe even the emperor who was out on an inspection tour. Yan Jin switched on the lights. Xiao Yu instantly came to his senses. It was another miniature artifact. It was different from the mini hamster town. The background for this artifact was the pitch-black night sky. For that purpose, the entire room was painted with a very deep blue color. The starlight scattered unevenly all over the walls. The ceiling was decorated with red sky lanterns hung by thin threads – varying in sizes in a picturesque disorder. And all of those details existed just for the sake of complimenting the artifact that was in the middle of the room, the splendid and magnificent maple leaf manor. It was the second grand present after the mini hamster town. The amount of effort spent on this present was something Xiao Yu could not calculate. All he knew was that he was moved to tears.